How Much Cardio Is Necessary to Burn Fat? Cardio burns calories for fat loss. Weight and fat loss happen when you burn more calories than you consume. Yes, cardio is a great way to create the calorie deficit necessary to drop unwanted pounds, but the specific amount you need may differ from what your friend or sister needs. If your calorie intake is high, you'll need more exercise to eliminate those calories than if you eat a low-calorie diet. Don't panic. It doesn't have to be all about numbers. Following professional exercise guidelines helps you create a slim and trim physique. In general, women need at least 150 minutes of cardio each week to maintain their health. This amount can help protect you from health conditions like heart disease, cancer and diabetes. However, MayoClinic.com advises as many as 300 minutes of cardio per week to lose excess fat. This might sound like a lot, but you don't have to do it in huge chunks. Even 10 to 15 minutes at a time is beneficial. It is best to spread your exercise time out through the week to keep your metabolism going. Give yourself a pat on the back for trying to create a healthy exercise routine. 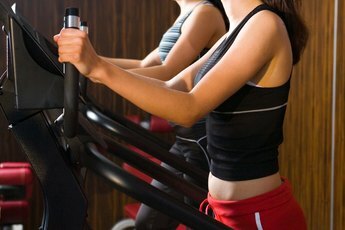 Some types of cardio burn hundreds of calories per hour, making it ideal for getting rid of fat. But, if you head to the local fast food joint and have a burger, fries and soda after your workout, you may be undoing your hard work. To burn one pound of fat in a week, you must eliminate 3,500 calories from your diet, or about 500 per day. If you burn 350 calories on the treadmill, but then eat a high calorie meal, you may not be creating a calorie deficit at all and will have to work out longer to burn fat. Balance your calorie intake with your calorie burn to get the most fat-burning benefits from your cardio. A leisurely stroll around the block burns some calories, but if you don't feel your heart rate accelerate, you're probably not burning many. The American Council on Exercise recommends staying within 55 to 90 percent of your maximum heart rate. To find your heart rate, take your pulse for 10 seconds and multiply that number by six. Staying within the targeted heart rate during each of your cardio sessions is a good way to ensure you are burning calories and fat. You won't burn any fat if you throw in the towel because you don't like cardio. The trick is to choose something you enjoy. If you hate running, don't base your workout around it. Instead, make the bulk of your sessions something that is fun for you, say swimming or dancing. In addition to cardio, add two strength-training sessions to your routine each week. This helps build lean muscle mass and boosts your metabolism, helping you burn more calories for fat loss. How Much Exercise Does Your Body Need Each Week for Good Cardiovascular Health? What Are the Health Benefits of Mini Steppers? 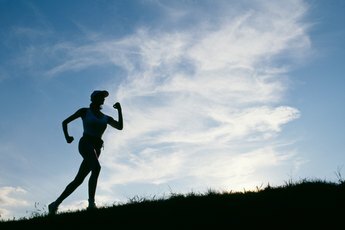 What Are Good Ways to Do Cardio Other Than Jogging? What Is Your Workout Routine When Cutting Fat? Is Cardio Really Necessary for Low Body Fat? How Much Cardio Is Needed for a Flat Stomach? Can Toning Reduce the Appearance of Belly Fat? Does a Half-Hour of Cardio Burn Fat?